Some girls do wrong without shame, and there are others who secretly and with apparently great modesty behave still worse than the former; and it is the same with shameful passions. There are many insincere maidens, such as: hypocrisy, vice, melancholy, the remembrance of injuries, disparagement of others in one’s heart. They appear to propose one thing, but they have something else in view. I have heard people slandering, and I have rebuked them. And these doers of evil replied in self-defence that they were doing so out of love and care for the person whom they were slandering. I said to them: ‘Stop that kind of love, otherwise you will be condemning as a liar him who said: “Him who secretly slanders his neighbour, him I drove away” (Palm 100:5). If you say you love, then pray secretly, and do not mock the man. For this is the kind of love that is acceptable to the Lord. He who wants to overcome the spirit of slander, should not ascribe the blame to the person who falls, but to the demon who suggests it. For no one really wants to sin against God, even though we do all sin without being forced to do so. I have known a man who sinned openly and repented secretly. I condemned him as a profligate, but he was chaste before God, having propitiated Him by a genuine conversion. In this way you will achieve two things: you will heal yourself and your neighbour with one plaster. This is one of the shortest ways to the forgiveness of sins; I mean, not to judge. ‘Judge not, that you be not judged’ (Luke 6:37). Fire and water are incompatible; and so is judging others in one who wants to repent. If you see someone falling into sin at the very moment of his death, even then do not judge him, because the Divine judgment is hidden from men. Some have fallen openly into great sins, but they have done greater good deeds in secret; so their critics were tricked, getting smoke instead of the sun. John Climacus (c.575-c.650): The Ladder of Divine Ascent, step 10 “on slander or calumny”, 3-8, translated by Archimandrite Lazarus Moore (Harper & Brothers, 1959) @ Prudence True. it is the reduction of anger, the mirror of progress, the realization of success, a proof of one’s condition, a revelation of the future, a sign of glory. […] Let us rise and listen to what that holy queen of the virtues cries with a loud voice and says to us: Come unto Me all ye that labour and are heavy laden, and I will give you rest. Take My yoke upon you, and you shall find rest for your souls and healing for your wounds. For My yoke is easy and is a sovereign remedy for great sins. […] When you are going to stand before the Lord, let the garment of your soul be woven throughout with the thread that has become oblivious of wrongs. Otherwise, prayer will bring you no benefit. Let your prayer be completely simple. For both the publican and the prodigal son were reconciled to God by a single phrase. […] Before all else let us list sincere thanksgiving first on our prayer-card. On the second line we should put confession, and heartfelt contrition of soul. Then let us present our petition to the King of all. This is the best way of prayer, as it was shown to one of the brethren by an angel of the Lord. Do not be over-sophisticated in the words you use when praying, because the simple and unadorned lisping of children has often won the heart of their heavenly Father. Do not attempt to talk much when you pray lest your mind be distracted in searching for words. One word of the publican propitiated God, and one cry of faith saved the thief. Loquacity in prayer often distracts the mind and leads to phantasy, whereas brevity makes for concentration. If you feel sweetness or compunction at some word of your prayer, dwell on it; for then our guardian angel is praying with us. John Climacus (c.575-c.650): The Ladder of Divine Ascent, step 28 “on prayer”, 1-11, translated by Archimandrite Lazarus Moore (Harper & Brothers, 1959) @ Prudence True. and when it fails in its quest, it painfully pursues it, and follows in its wake grievously lamenting. Or thus: mourning is a golden spur in a soul which is stripped of all attachment and of all ties, fixed by holy sorrow to watch over the heart. and of the perfect—humility, thirst for dishonours, voluntary craving for involuntary afflictions, non-condemnation of sinners, compassion even beyond one’s strength. The first are acceptable, the second laudable; but blessed are those who hunger for hardship and thirst for dishonour, for they shall have their fill of the food that does not cloy. […] Theology will not suit mourners, for it is of a nature to dissolve their mourning. For the theologian is like one who sits in a teacher’s seat, whereas the mourner is like one who spends his days on a dung heap and in rags. That is why David, so I think, although he was a teacher and was wise, replied to those who questioned him when he was mourning: ‘How shall I sing the Lord’s song in a strange land?’—that is to say, the land of passions. Both in creation and in compunction there is that which moves itself and that which is moved by something else. When the soul becomes tearful, moist and tender without effort or trouble, then let us run, for the Lord has come uninvited, and is giving us the sponge of God-loving sorrow and the cool water of devout tears to wipe out the record of our sins. Guard these tears as the apple of your eye until they withdraw. Great is the power of this compunction—greater than that which comes as a result of our effort and meditation. He who mourns when he wishes has not attained the beauty of mourning, but rather he who mourns on the subjects of his choice, and not even on these, but on what God wants. The ugly tears of vainglory are often interwoven with mourning which is pleasing to God. Acting devoutly, we shall find this out by experiment when we see ourselves mourning and still doing evil. […] When our soul leaves this world we shall not be blamed for not having worked miracles, or for not having been theologians or contemplatives. But we shall certainly have to give an account to God of why we have not unceasingly mourned. John Climacus (c.575-c.650): The Ladder of Divine Ascent, step 7 “on mourning which causes joy”, 1, 4, 24-26, 70, translated by Archimandrite Lazarus Moore (Harper & Brothers, 1959) @ Prudence True. The holy virtues are like Jacob’s ladder, and the unholy vices are like the chains that fell from the chief Apostle Peter. For the virtues, leading from one to another, bear him who chooses them up to Heaven; but the vices by their nature beget and stifle one another. And as we have just heard senseless anger calling remembrance of wrongs its own offspring, it is appropriate that we should now say something about this. Remembrance of wrongs is the consummation of anger, the keeper of sins, hatred of righteousness, ruin of virtues, poison of the soul, worm of the mind. Remembrance of wrongs is shame of prayer, stopping of supplication, estrangement of love, a nail stuck in the soul. Remembrance of wrongs is pleasureless feeling beloved in the sweetness of bitterness, continuous sin, unsleeping transgression, hourly malice. This dark and hateful passion, I mean remembrance of wrongs, is one of those that are produced but have no offspring. That is why we do not intend to say much about it. He who has put a stop to anger has also destroyed remembrance of wrongs; because childbirth continues only while the father is alive. He who has obtained love has banished revenge; but he who nurses enmities stores up for himself endless sufferings. A banquet of love dispels hatred, and sincere gifts soothe a soul. But an ill-regulated banquet is the mother of boldness, and through the window of love gluttony leaps in. I have seen hatred break the bond of long-standing fornication, and afterwards remembrance of wrongs, in an amazing way, did not allow the severed union to be renewed. Wonderful sight—a demon curing a demon! But perhaps this is the work not of demons but of Divine Providence. Remembrance of wrongs is far from strong natural love, but fornication easily comes near it, just as a hidden louse can sometimes be seen in a dove. […] Remembrance of wrongs is an interpreter of Scripture of the kind that adjusts the words of the Spirit to its own views. Let it be put to shame by the Prayer of Jesus. […] The remembrance of Jesus’ sufferings cures remembrance of wrongs which is mightily shamed by His forbearance. Worms grow in a rotten tree, and malice finds a place in falsely meek and silent people. He who has cast it out has found forgiveness, but he who sticks to it is deprived of mercy. […] The forgetting of wrongs is a sign of true repentance. But he who dwells on them and thinks that he is repenting is like a man who thinks he is running while he is really asleep. John Climacus (c.575-c.650): The Ladder of Divine Ascent, step 9 “on remembrance of wrongs”, 1-8, 10, 14-15, 17-15, 17, translated by Archimandrite Lazarus Moore (Harper & Brothers, 1959) @ Prudence True. If it is a mark of extreme meekness even in the presence of one’s offender to be peacefully and lovingly disposed towards him in one’s heart, then it is certainly a mark of hot temper when a person continues to quarrel and rage against his (absent) offender both by words and gestures, even when by himself. If the Holy Spirit is peace of soul, as He is said to be, and as He is in reality, and if anger is disturbance of heart, as it actually is and as it is said to be, then nothing so prevents His presence in us as anger. Though we know very many intolerable fruits of anger, we have only found one, its involuntary offspring, which, though illegitimate, is nevertheless useful. I have seen people flaring up madly and vomiting their long-stored malice, who by their very passion were delivered from passion, and who have obtained from their offender either penitence or an explanation of the long standing grievance. I have seen others who seemed to show a brute patience, but who were nourishing resentment within them under the cover of silence. And I considered them more pitiable than those given to raving, because they were driving away the holy white Dove with black gall. We need great care in dealing with this snake; for it too, like the snake of physical impurities, has nature collaborating with it. […] Sometimes singing, in moderation, successfully relieves the temper. But sometimes, if untimely and immoderate, it lends itself to the lure of pleasure. Let us then appoint definite times for this, and so make good use of it. […] It is bad to disturb the eye of the heart by anger, according to him who said: ‘My eye is troubled from anger.’ But it is still worse to show in words the turmoil of the soul. […] If you want, or rather intend, to take a splinter out of another person, then do not hack at it with a stick instead of a lancet for you will only drive it deeper. And this is a stick—rude speech and rough gestures. And this is a lancet—tempered instruction and patient reprimand. ‘Reprove,’ says the Apostle, ‘rebuke, exhort,’ but he did not say ‘beat’. John Climacus (c.575-c.650): The Ladder of Divine Ascent, step 8 “on freedom from anger and on meekness”, 13-15, 17, 19-20, translated by Archimandrite Lazarus Moore (Harper & Brothers, 1959) @ Prudence True. Freedom from anger, or placidity, is an insatiable appetite for dishonour, just as in the vainglorious there is an unbounded desire for praise. Freedom from anger is victory over nature and insensibility to insults, acquired by struggles and sweat. Meekness is an immovable state of soul which remains unaffected whether in evil report or in good report, in dishonour or in praise. Anger is a reminder of hidden hatred, that is to say, remembrance of wrongs. Anger is a desire for the injury of the one who has provoked you. Irascibility is the untimely blazing up of the heart. Bitterness is a movement of displeasure seated in the soul. Peevishness is a changeable movement of one’s disposition and disorder of soul. As with the appearance of light, darkness retreats, so at the fragrance of humility all anger and bitterness vanishes. Some who are prone to anger are neglectful of the healing and cure of this passion. But these unhappy people do not give a thought to him who said: ‘The moment of his anger is his fall’ (Ecclesiasticus 1:22). There is a quick movement of a millstone which in one moment grinds and does away with more spiritual grain and fruit than another crushes in a whole day. And so we must, with understanding, pay attention. It is possible to have such a blaze of flame, suddenly fanned by a strong wind, as will ruin the field of the heart more than a lingering flame. And we ought not to forget, my friends, that the wicked demons sometimes suddenly leave us, so that we may neglect our strong passions as of little importance, and then become incurably sick. either it cures its wound by its patience, or by retiring it will certainly discover its weakness, its cowardly flight making this clear to it as in a mirror. An angry person is a wilful epileptic, who on a casual pretext keeps breaking out and falling down. Nothing is so inappropriate to penitents as an agitated spirit, because conversion requires great humility, and anger is a sign of every kind of presumption. 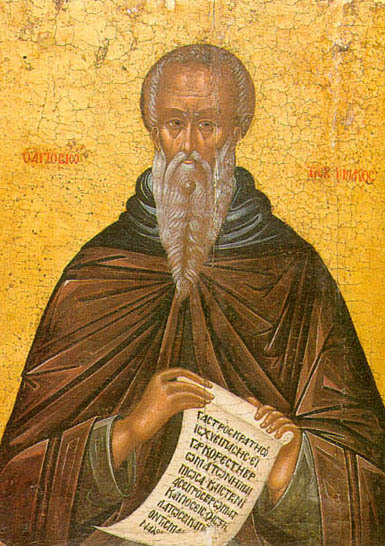 John Climacus (c.575-c.650): The Ladder of Divine Ascent, step 8 “on freedom from anger and on meekness”, 2-12, translated by Archimandrite Lazarus Moore (Harper & Brothers, 1959) @ Prudence True. He who loves the Lord has first loved his brother, because the second is a proof of the first. One who loves his neighbour can never tolerate slanderers, but rather runs from them as from fire. He who says that he loves the Lord but is angry with his brother is like a man who dreams that he is running. The power of love is in hope, because by it we await the reward of love. Hope is a wealth of hidden riches. Hope is a treasure of assurance of the treasure in store for us. It is a rest from labours; it is the door of love; it is the superannuation of despair; it is an image of what is absent. The failure of hope is the disappearance of love. Toils are bound by it. Labours depend on it. Mercy encircles it. A monk of good hope is a slayer of despondency; with this sword he routs it. Anger destroys hope, because hope does not disappoint (Romans 5:5), but a passionate man has no grace [or “an angry man is not beautiful” (Proverbs 11:25)]. Love bestows prophecy; love yields miracles; love is an abyss of illumination; love is a fountain of fire—in the measure that it bubbles up, it inflames the thirsty soul. Love is the state of angels. Love is the progress of eternity. Tell us, fairest of virtues, where thou feedest thy flock, where thou restest at noon (Song of Songs 1:6). Enlighten us, quench our thirst, guide us, take us by the hand; for we wish at last to soar to thee. Thou rulest over all. And now thou hast ravished my soul. I cannot contain thy flame. So I will go forward praising thee. Thou rulest the power of the sea, and stillest the surge of its waves and puttest it to death. Thou hast humbled the proud—the proud thought—like a wounded man. With the arm of thy power thou hast scattered thy enemies (Psalm 88:9-10), and thou hast made thy lovers invincible. John Climacus (c.575-c.650): The Ladder of Divine Ascent, step 30, 25-36, translated by Archimandrite Lazarus Moore (Harper & Brothers, 1959) @ Prudence True. If the face of a loved one clearly and completely changes us, and makes us cheerful, happy and carefree, what will the Face of the Lord not do when He makes His Presence felt invisibly in a pure soul? Fear when it is an inner conviction of the soul destroys and devours impurity, for it is said: Nail down my flesh with the fear of Thee (Psalm 118:120). And holy love consumes some, according to him who said: Thou hast ravished our heart, Thou hast ravished our heart (Song of Songs 4:9). But sometimes it makes others bright and joyful, for it is said: My heart trusted in Him and I have been helped; even my flesh has revived (Psalm 27:7); and: When the heart is happy the face is cheerful (Proverbs 15:13). So when the whole man is in a manner commingled with the love of God, then even his outward appearance in the body, as in a kind of mirror, shows the splendour of his soul. That is how Moses who had looked upon God was glorified (cf. Exodus 34; 2 Corinthians 3:14). Those who have reached such an angelic state often forget about bodily food. I think that often they do not even feel any desire for it. And no wonder, for frequently a contrary desire knocks out the thought of food. I think that the body of those incorruptible men is not even subject to sickness any longer, because it has been rendered incorruptible; for they have purified the inflammable flesh in the flame of purity. I think that even the food that is set before them they accept without any pleasure. For there is an underground stream that nourishes the root of a plant, and their souls too are sustained by a celestial fire. The growth of fear is the beginning of love, but a complete state of purity is the foundation of theology. He who has perfectly united his feeling to God is mystically led by Him to an understanding of His words. But without this union it is difficult to speak about God. The engrafted Word (cf. James 1:21) perfects purity, and slays death by His presence; and after the slaying of death, the disciple of divine knowledge is illumined. The Word of the Lord which is from God the Father is pure, and remains so eternally. But he who has not come to know God merely speculates. Purity makes its disciple a theologian, who of himself grasps the dogmas of the Trinity. John Climacus (c.575-c.650): The Ladder of Divine Ascent, step 30, 16-24, translated by Archimandrite Lazarus Moore (Harper & Brothers, 1959) @ Prudence True. He who wishes to speak about divine love undertakes to speak about God. But it is precarious to expatiate on God, and may even be dangerous for the unwary. The angels know how to speak about love, and even they can only do this according to the degree of their enlightenment. God is love. So he who wishes to define this, tries with bleary eyes to measure the sand in the ocean. Love, by reason of its nature, is a resemblance to God, as far as that is possible for mortals; in its activity it is inebriation of the soul; and by its distinctive property it is a fountain of faith, an abyss of patience, a sea of humility. Love is essentially the banishment of every kind of contrary thought for love thinks no evil. Love, dispassion and adoption are distinguished as sons from one another by name, and name only. Just as light, fire and flame combine to form one power, it is the same with love, dispassion and adoption. As love wanes, fear appears; because he who has no fear is either filled with love or dead in soul. There is nothing wrong in representing desire, and fear, and care and zeal and service and love for God in images borrowed from human life. Blessed is he who has obtained such love and yearning for God as an enraptured lover has for his beloved. Blessed is he who fears the Lord as much as men under trial fear the judge. Blessed is he who is as zealous with true zeal as a well-disposed slave towards his master. Blessed is he who has become as jealous of the virtues as husbands who remain in unsleeping watch over their wives out of jealousy. Blessed is he who stands in prayer before the Lord as servants stand before a king. Blessed is he who unceasingly strives to please the Lord as others try to please men. Even a mother does not so cling to the babe at her breast as a son of love clings to the Lord at all times. He who truly loves ever keeps in his imagination the face of his beloved, and there embraces it tenderly. Such a man can get no relief from his strong desire even in sleep, even then he holds converse with his loved one. So it is with our bodily nature; and so it is in spirit. One who was wounded with love said of himself (I wonder at it): I sleep because nature requires this, but my heart is awake in the abundance of my love. John Climacus (c.575-c.650): The Ladder of Divine Ascent, step 30, 4-13, translated by Archimandrite Lazarus Moore (Harper & Brothers, 1959) @ Prudence True. Loose him (cf John 11:44) from passions, and let him go to blessed dispassion. Otherwise he will have gained nothing. who, standing between action and contemplation, will raise hands of prayer for us to God, so that guided by Him we may cross the sea of sin and rout the Amalek of the passions (Exodus 17). That is why those who have surrendered themselves to God, deceive themselves if they suppose that they have no need of a director. Those who came out of Egypt had Moses as their guide, and those who fled from Sodom had an angel. The former are like those who are healed of the passions of the soul by the care of physicians: these are they who come out of Egypt. The latter are like those who long to put off the uncleanness of the wretched body. That is why they need a helper, an angel, so to speak, or at least one equal to an angel. until by simplicity, deep angerlessness and diligence, we make our mind, which is a greedy kitchen dog addicted to barking, a lover of chastity and watchfulness. John Climacus (c.575-c.650): The Ladder of Divine Ascent, step 1, 6-8, translated by Archimandrite Lazarus Moore (Harper & Brothers, 1959) @ Prudence True.